TukTuk UK is not your everyday client, so you can imagine the excitement in the studio when this opportunity landed. TukTuk UK came to Ultimate for advice on their brand strategy, identity and a new website, and we were delighted to help. This business venture that started from one alcohol-fuelled evening at a charity ball, has now lead to being the UK’s largest importer of tuk tuks. For a fun and unique business like this, it was essential that the personality of the brand needed to be reflected in any new identity we developed. Essential to the client was the heritage and roots of where this venture began in India. As an importer of genuine Bajaj tuk tuks, we wanted this to be reflected in the brand. The colour palette was developed with this in mind to communicate the orgins of India in a modern and contemporary way. The chosen brand mark cleverly imitates the shape of a TukTuk by using a bespoke, hand-rendered font. Not only that, but this identity reflects the movement and fun personality of the brand. Essential to the client was the heritage and roots of where this venture began in India. As an importer of genuine Bajaj tuk tuks, we wanted this to be reflected in the brand. The website has a number of features designed to engage and enhance the interaction with visitors online, these also act as ways to improve conversion online. 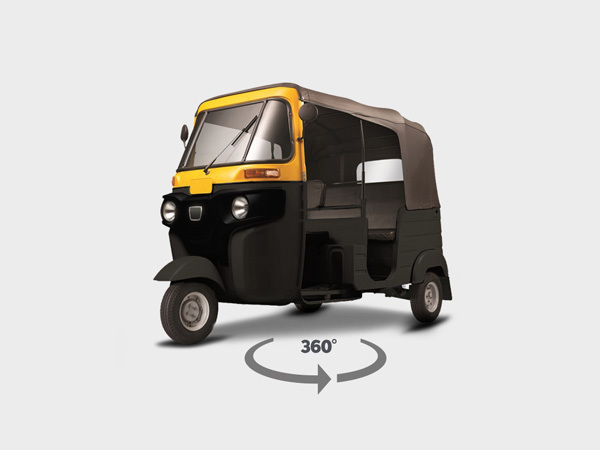 The features include a 360 Viewer, 'Customise your Tuk Tuk' feature and the ability to buy online. The successful formulation of the brand led us to the website design, where the journey of the tuk tuk story really comes to life through a hand drawn illustration. The purpose of the website is to quickly and effectively communicate that you can buy or hire a tuk tuk in the UK. The priority had to be on generating sales, as well as communicating why you would want a tuk tuk over another vehicle or marketing collateral. Not being a common mode of transport, part of the website’s purpose was to engage the visitor with the endless opportunities that owning or hiring a tuk tuk presents, from buying one to sell at a charity auction – like Alan Shearer, for a birthday present suitable for a motorbike champion like Carl Fogarty, through to a branded vehicle for promotion purpose or a wedding chariot. We devised the inspiration gallery to showcase the wild to the wacky, to whet the appetite of website visitors. – Online store – from the website visitors have the opportunity to buy further into the brand. Ultimate has also worked with Tuk Tuk UK to develop a range of apparel. With a brand as stand-out and bespoke as the one we created, this is a brand to be worn. In the same way as Lambretta or VW, Tuk Tuk UK have a vision to be a brand to be seen not only on the streets, but on t-shirts. Our Account managers can often be seen in a ‘What the tuk tuk’ hoodie! Since the launch of the site, Tuk Tuk UK have had fantastic exposure on social media and the press, following the launch of a charity campaign, ‘Travels to my elephant’, where 15 tuk tuks were transformed into extraordinary pieces of mobile art individually designed by a host of international artists, milliners and fashion houses including Diane von Furstenberg, Manish Arora, Carolina Herrara, Philip Colbert and The Rodnik Band and Nicky Haslam. Ultimate has since had the honour of designing a bespoke tuk tuk for King of the Jungle and motorbike champion, Carl Fogarty. The design took inspiration from jungle khaki and signature eyes. Foggy tweeted at his delight of getting this new racer for his 50th birthday. We hope that Tuk Tuk UK’s success will continue as they are now armed with a brand to be proud of.